Welp, I'm just starting out so I've been practicing backcombing and I went through a bunch of threads here on it already but didn't really see anyone having similar issues to mine. So I made a new thread. Anywho. I've gone through a bag of hair already just trying to get it right xD but alas I seem to keep ending up with the same issues. my loops are gigantic. I watched rivetlickers tutorial since everyone seems to start there and she doesn't tie them off really, so the loops are kind of free forming. Mine are like 'nope' haha. 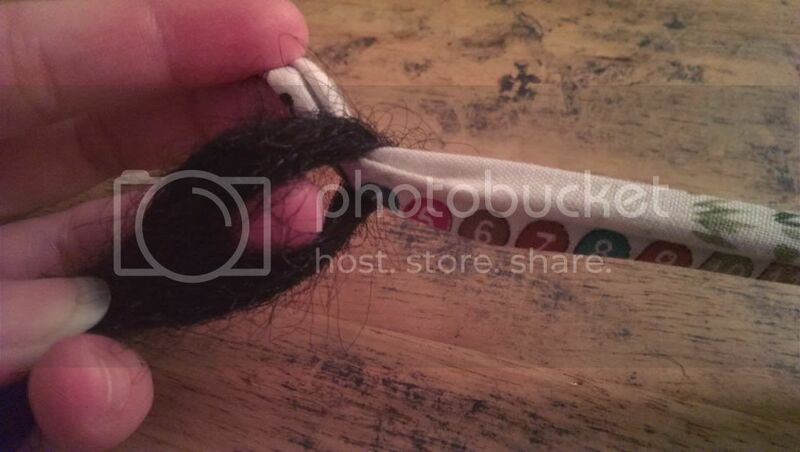 the hair on both sides of the fabric tighten but they wont comb together (which is problem 2). I mean, I thought it was no big deal because of the twisting later, but when I twist them it's reaaalllyy thin up there and I figure thats a problem. I'm kinda pulling it apart here so you can better see what i mean but it's very obvious in real life even without holding it out like that. 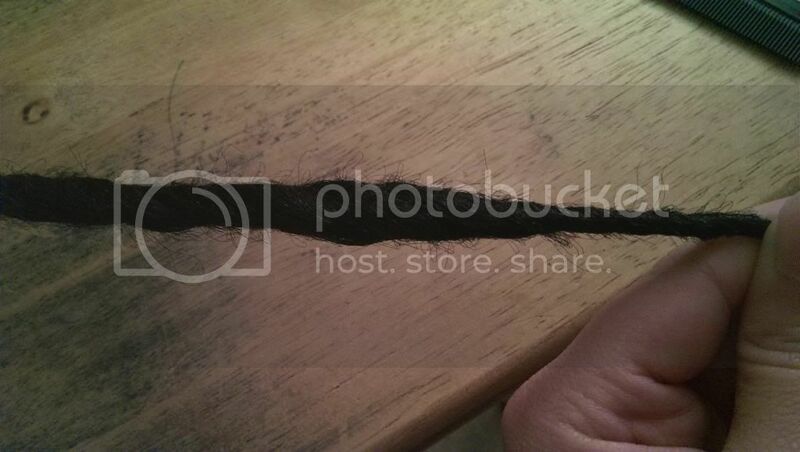 the two pieces of hair just don't want to connect to each other. I've tried sort of 'blending' them before backcombing but they still manage to separate D< tis very annoying. dreads are supposed to be larger at the top and taper off. Mine keep ending up the opposite way. It doesn't matter how much i try to backcomb it or pull it apart or anything I always end up with a sort of thick section at the bottom. So I get this bump right before the hair starts to run out. The times I've tried to fix it by pulling it apart and backcombing more either ends up making the knot bigger or making the entire dread really really thick and stiff and uniform. Like all one size. still no tapering. Is that LA Trend hair? If so, I hate that brand for natural colours. Also get rid of the fabric and use the hook end of a thick plastic coat hanger instead. You'll eventually get the hang of it and it's much easier to make clean loops. Backcomb both front and back of the dread so the initial first inch or so is knotted together, then work the sides, making sure you backcomb right up to the hook. Backcombing is a simple process once you get the hang of it but it sure does help when you get a brand of hair that doesn't feel brittle like I think LA Trend does. The trick is to do it gradually, inch by inch, making sure you backcomb all the way around the dread and not just from one side. Use your index finger and thumb to feel your way down, making sure that you don't have any lumps, bumps or unbackcombed bits hiding away. Gently run your hand down the length of the hair throughout this process making sure it's not bunching up at the top, and continue backcombing downwards, inch by inch. You'll eventually get it into a smooth gradual taper. 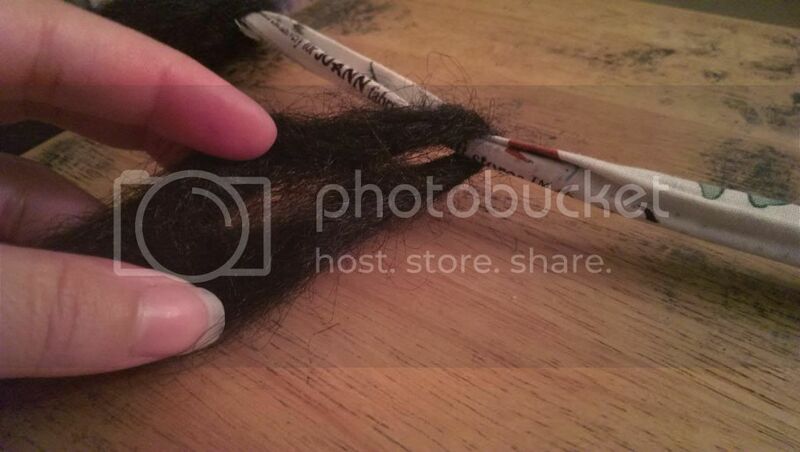 When it comes to sealing the SEs, pop the dread back on the hook and again with using your index finger and thumb, twist the hair into the dread shape making sure it's nice and tight around the hook and steam away. Hold the loop in the steam a little bit longer than the rest of the hair, and there you go! I don't believe it is, it was Afri something brand. I could tell you if i saw it but i threw the paper away. I got a couple different brands to play with cause I didn't know if it made a huge difference but none of them are LA Trend so I guess thats good =D And I wanted to do it with a coat hanger actually but I just couldn't figure out a set up. No worries though, i'm still just practicing so I'll work on getting that done as well. Unless of course it's actually the fabric that is keeping it from knotting together in which case BUUUUHHH. anyhow, thank you so much for your advice! I will implement it asap and see what happens!